It'll be like using NFC, except this doesn't require tags. While NFC has become a standard feature on Android phones these days, it is only as convenient as it is available on the other end, not to mention the awkwardness of aligning the antennas as well. As such, Carnegie Mellon University's Future Interfaces Group is proposing a working concept that's practically the next evolution of NFC: electromagnetic emissions sensing. You see, as Disney Research already pointed out last year, each piece of electrical device has its own unique electromagnetic field, so this characteristic alone can be used as an ID so long as the device isn't truly powered off. With a little hardware and software magic, the team has come up with a prototype smartphone -- a modified Moto G from 2013 -- fitted with electromagnetic-sensing capability, so that it can recognize any electronic device by simply tapping on one. 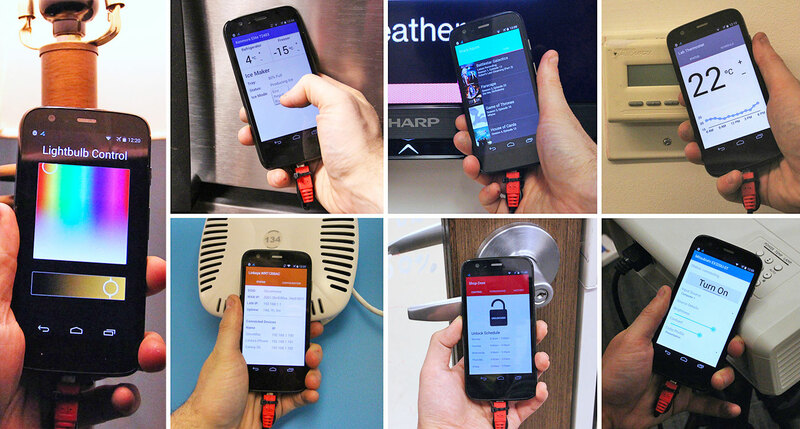 With the help of machine learning to classify device types, this phone was able to accurately toggle the corresponding apps or charms by merely tapping on almost anywhere on a variety of connected devices: Phillips Hue LED bulb, fridge, TV, thermostat, router, smart door lock, projector and more. Even "dumb" devices such as a coffee machine can be recognized, it's just that the phone obviously wouldn't be able to control them, but one could implement other types of interaction (maybe launch a coffee capsule catalog upon tapping?). In another set of demos, the team showed how the phone could show contextual charms upon tapping various connected devices. For instance, tapping a monitor would give you the option to send either files or pre-selected text from the phone to the PC (which sounds more straightforward than the NFC feature in Windows); whereas tapping a TV or a Chromecast Audio would give you the cast button. While the prototype phone has a dongle sticking out from the bottom, Future Interfaces Group reckoned the commercialized version of this electromagnetic-sensing technology may be able to use the phone's existing antenna or metallic chassis to achieve the same goal. Another challenge is to improve noise rejection and also fine-tune this technique, so that devices of the same model can be distinguished from the minute differences in their electromagnetic signatures, which is something that Disney Research appeared to be confident in. As to when we may see this feature on future smartphones, group director Chris Harrison said it'll be at least a year before it gets commercialized -- much like the team's other recent project, Electrick.